Pizza does not intend to hurt you, but rather soothe your anxieties and allow you to drown your feelings in cheese, bread and sauce. But people apparently have problems with pizza, despite its friendly intentions. 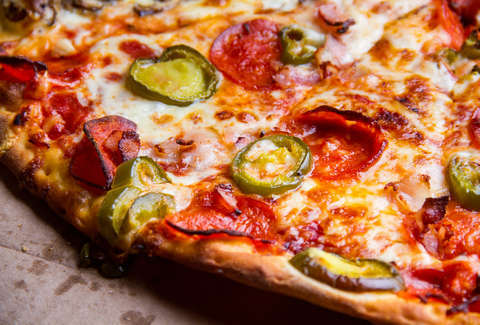 According to numbers compiled by US Consumer Product Safety Commission (USCPSC), "pizza related accidents" sent 2,300 people to the emergency room last year. These accidents vary remarkably, too, encompassing basically every way an innocuous, anodyne pizza can serve you a medical bill. The numbers were initially tweeted by the agency, as part of a report baring a grim title: "Pizza: Tales of Betrayal." As the tweet explains, the injuries ranged from "cuts (from cutting pizza), burns (from pizza and pans), falling while carrying pizza, falling in pizza places, falling out of bed while reaching for pizza," and assumedly every other embarrassing situation that has landed someone in the hospital. According to Munchies, the agency compiles its data by recording injuries caused by consumer products and adding it to its National Electronic Injury Surveillance System (NEISS). All of the injuries that Americans sustain while using normal consumer products live in this immense log of data. The data is collected from 96 hospitals across the country and US territories, and ultimately produces "nationwide estimates of product-related injuries," according to its website. The 2,300 incidents reported by the CPSC is just an estimate. The agency received 63 pizza-related injury reports itself, but its Epidemiology department extrapolated the data, projecting that 2,300 pizza-related ER visits occurred throughout the country in 2017. While the data might be foreboding, fear not the pizza. It isn't here to harm you.